There's the moment when your phone goes below 20 percent power and you get that foreboding notification—if you don't plug in soon, you're going to die. In some situations, even careful planning can't guarantee a recharge. 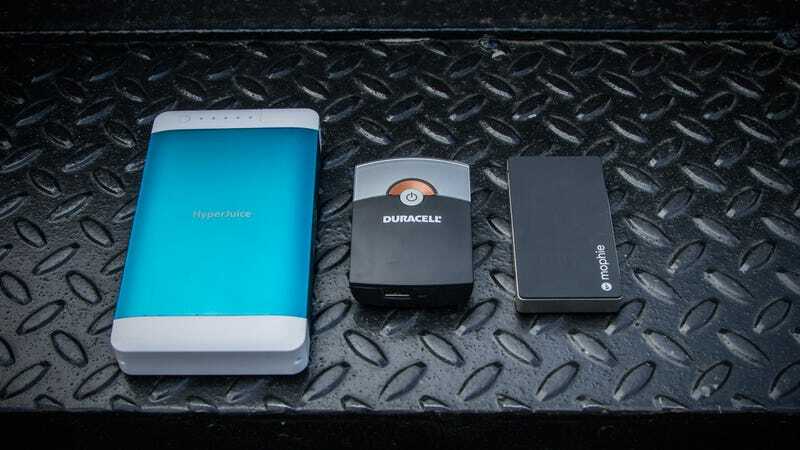 That's why there are portable power packs—when the power is out, or your travels take you far from an outlet, these are the gadgets that hold a charge for other gadgets. Do these little juice boxes work? We hooked the chargers to a team of gadget guinea pigs low on juice—an iPhone 4, a Samsung Galaxy S3, and an iPad. We recorded the battery life on the computer and timed how long it took to recharge on the power packs. After each recharge, we'd deplete the gadget's battery again, and match a different gadget with another charger. For these portable power stations to be effective, they have to work quickly, and they can't crap out before the device is totally gassed up. The Duracell doesn't have a long life span. When charging the iPhone 4 at a 45 percent charge, it lasted for an hour and 10 minutes, boosting the phone to 80 percent before it cut out. Once the power pack was tapped out and then plugged in, it took a whole three hours to regain its own charge. That's pretty awful, considering that's longer than the amont of time it was working. It's also not compatible with tablets. With a USB port and a mini USB attached, you could technically charge two gadgets at once with this little guy, but you wouldn't want to. The sleek, all black Mophie Juice Pack powerstation is lightweight and compact—easy to slip in your purse or your pocket. But it's another case of something that isn't capable of charging your gadget all the way. If you need a power source while you're out for the day, it's a decent option. While it works more swiftly and lasts longer than the Duracell, don't anticipate getting much oomph out of it. Plugged into an S3 with 24 percent battery left, the Juicepack took the phone to 54 percent, over the course of two hours, then it died. The Mophie needed to charge for an hour before it could be used again, after which it took another hour to bring the phone up to a full tank. (Obviously, this was just for testing—in a real scenario, you'd simply plug in the S3). The Juice Pack doesn't work for tablets. That said, it charged more quickly than the Duracell, and it didn't take all that long to be up and running again. If you're out all day and worried about your battery, this is a good thing to have on hand. The HyperJuice Plug is the only charger you need. The comparison is almost unfair. This is just so much more powerful, more robust (and, frankly, more expensive) than the competition. That said, all the products in this test do the same basic task—this one just does it much more effectively. If you were suffering through an extended power outage, this would be the right backup to have. The stalwart brick will power up an iPhone and your iPad simultaneously, and filling them both up without running itself dry. The manufacturer claims it can charge a phone 12 times before it goes dark. In a little over an hour, the Plug zipped the iPhone from 29 percent to a full charge. Meanwhile, it was also nourishing the iPad, which went from 39 percent to max power in an hour and a half. And the HyperJuice still had more power left in it. The drawback is that it's much larger and heavier than the other two. It's much bulkier than any of the devices' chargers, for that matter. And it takes 12 hours on an outlet to regain its own full charge. But these are minor issues if you're traveling far from the wired world, and having a reliable backup power supply means more than a little extra heft in your bag.